Can anyone chime in on a company that makes custom electrical panels that would tie in my 12 /32/ 120 volt systems, I would need two one for battery and AC main on, then my house panel. I have looked at all the blue seas stuff, and they don't have any off the shelf 32 volt stuff. Any of you have some experience with custom panel manufacturers, cost, pros, cons, ect?? While they don't list 32 volt systems, They will build it. I have looked at theblue seas system and although it looks nice, I think it is too modern looking for the vessel. I do like the product i have seen on MMes and Have sent them an email still waiting a reply. I now systems like this can range in price depending on allot of different variables. Lyod, what was the average price of the blue seas system? Did you have 12 / 32 / 120? on the same panel or just one voltage? Paneltronic and Blue Seas are the popular ones for custom or semi-custom work, but this is more die-cutting than rocket science. Getting the correct switches and doing the crimping and corrosion control is the important bit, in my view. Not sure exactly what you're looking for. I got a small electrical panel from Front Panel Express. You can download their software and lay it all out yourself, they'll make it. This is just the panel though, you'd need to supply all the switches, breakers, etc. I'm planning a bigger project to do my whole upper helm panel once I figure out what I'm going to put on it. and the price is unbeatable.. I have used these guys in the past for small projects, but they also do mega yachts and everything in between. One thing I found helpful with the FrontPanel software was I could print out the panel, tape and cut it to actual size, and test-fit. I found I wanted to make some small adjustments. I would have been out of luck if I had to order it based on my initial measurements. The front panel system is definitely the top contender now, glad I asked, didn't even know there was an option like that. Printing it makes it easier to make sure it's right. What breaker system did you use? Blue sea? The have all measurement specs on their website. Creating a macro for the blue sea stuff would be great? Anyone already done a panel for blue sea stuff willing to share your layout file? What will you do for breaker bus-bars. 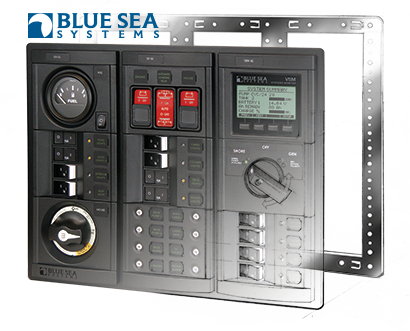 Blue Sea won't sell just the bus-bars, and the Ancor breaker bus-bars are not tin-plated. My guess by the time you go alacart Blue Sea parts, it would be cheaper to buy their panel complete. Front Panel is great when you need something that doesn't exist.